I just finished watching the Apple Event this morning (it's 2 AM here in Manila) and I am stoked with two things that the guys in Cupertino unveiled today. The company just released the latest models of their flagship iPhone last month and now, they released what could be the last of their gadgets for this year in time for the holidays. 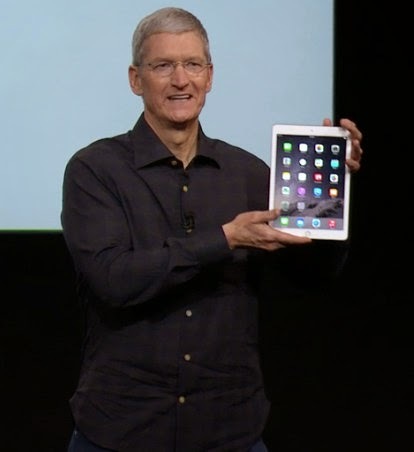 Apple introduced this morning the iPad Air 2, which they say is the thinnest and most powerful iPad ever. In introducing the new iPad, Phil Schiller, Apple’s senior vice president of Worldwide Marketing can't help gushing about the latest model of their gadget. He described it as the thinnest tablet in the world and that two of the new gadget stacked on top of each other would still be thinner than the first generation iPad. iPad Air 2 has a new Retina display with anti-reflective coating, second generation 64-bit A8X chip, all-new iSight and FaceTime HD cameras, faster Wi-Fi and LTE wireless. It also includes my favorite Touch ID fingerprint identity sensor. It's open for pre-order on the U.S. Apple Online Store starting later today. The Wi-Fi models are priced at $499, $599 and $699 for the 16, 64, and 128 GB capacities, respectively. It will be available in gold, silver, and space gray. "One thing that is definitively better is the new camera, which is now 8 megapixels; it's a lot faster and shots seemed a lot clearer, at least in Apple's hectic demo room. " I am not yet sure how much iPad Air 2 will cost in the Philippines and when it will be available here but I hope just before the Christmas Season. Apple also unveiled the iPad Mini 3 but I prefer the 9.7 inch iPad Air. I am eyeing the 64GB wifi model owing to the experience of the on-air update of iOS a few months ago when I need to delete some files to get some space on my 16GB gadget. Another good news at the event was that Apple has finally updated the Mac mini. Nothing much change in the design of the Mac mini, but many changes happened inside. It now features fourth-generation Intel Core processors, faster integrated graphics, 802.11ac Wi-Fi, and Thunderbolt 2. The new machine will be shipping with the latest iteration of OSX, Yosemite which was also released this morning and now available for download for free. It also has a new lower starting price at $499, making Apple’s most affordable Mac an even better value. 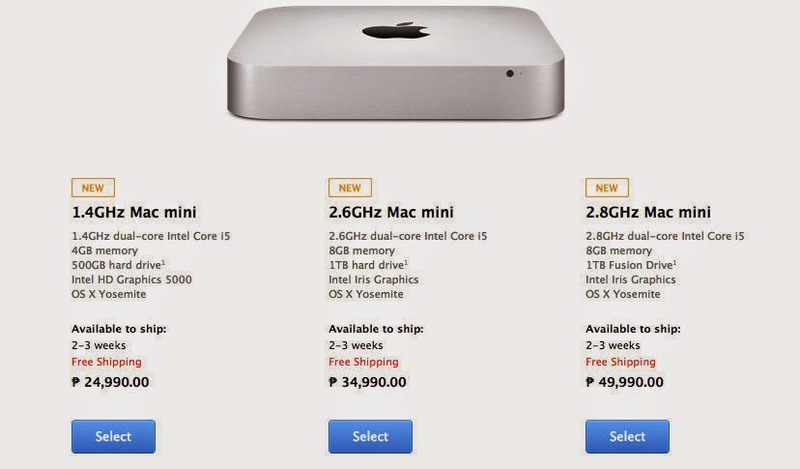 Below is a screenshot from the Official Philippine Apple Store of the pricing for the new Mac mini. I checked our online forum during the event and the most common complaint about the new Mac mini model is that it doesn't come with a quad core CPU. Nevertheless, I am glad there's a new Mac mini and that means I can change my hardworking Mac soon. In fact, the new Mac mini is now available on the official Philippine Apple Store. Shipping time is 2 to 3 weeks at the moment. So these are too items on my Christmas wish list. I'm still thinking which of them I will finally get. I might get lucky though and ultimately get both of them. Happy Holidays, indeed!